Together they will develop a victory-ready E-MTB for the American Eagle brand, to compete in the newly-formed UCI electric mountain bike racing class. And in the run-up to the 2020 Olympic Games in Tokyo, Bafangs become team sponsor for one of the world’s most successful Elite XC teams. 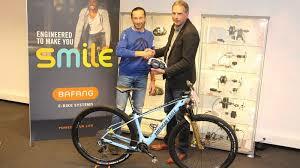 Wijchen, Netherlands / Suzhou, China, January 2019 – Bafang is marking the start of the 2019 MTB racing season by becoming the first ever manufacturer of pedelec drive systems to sponsor the UCI World Cup. What’s more, they are doing so at the very highest level: the ‘CST sandd. Bafang Mountainbike Racing Team’ is truly world class when it comes to wins, podium places and Championship titles. This level of performance is simply a continuation of the example set to the team, which was founded in 2008, by its captain Bart Brentjens (Netherlands), first with his World Championship title (1995 in Kirchzarten, Germany), but above all with his Gold Medal victory in MTB at the Olympic Games of 1996 in Atlanta, USA. Bafang’s commitment extends well beyond simple sports sponsorship. The e-bike drive system specialists based in Suzhou (China), have agreed an intensive development collaboration with Bart Brentjens’ MTB brand American Eagle, with the aim of producing an E-MTB capable of competing at the highest level – tuned and ready to race in the World Championships for the new ‘E-Mountain Bike’ class, which was recently announced by cycle sport’s world governing body, the UCI. The Championships will be contested in late August 2019 in Mont St. Anne, Canada. A key element in Bafang and American Eagle’s future racing success is the M500 drive system. Its nominal power rating of 250 watts reflects the universal legal limit for pedelecs, but with its impressive 95 Newton metres of torque, the key factor when it comes to dynamic ride performance, it leaves most of its competitors far behind.